The front page of the April 18, 1961, edition of the Chattanooga Daily Times includes news of the Bay of Pigs. Editor's note: This is part of an ongoing series commemorating the 150th anniversary of the Chattanooga Times Free Press. To read more, visit timesfreepress.com/150years. America saw a president murdered and invaded a country. Columbine and Waco became names forever associated with the kind of tragedy that creates permanent fear. Mother Earth sank the most famous ship in the world and devastated San Francisco. A man named Webster published a dictionary.
' April 14, 1828: Noah Webster publishes the first American Dictionary of the English Language.
' April 14, 1865: President Abraham Lincoln is assassinated by John Wilkes Booth at Ford's Theater in Washington, D.C.
' April 15, 1912: The Titanic sinks after hitting an iceberg off Newfoundland, killing 2,224.
' April 17, 1961: America invades Cuba attempting to overthrow Premier Fidel Castro. The failed Bay of Pigs invasion led to the Cuban missile crisis in 1962.
' April 18, 1906: An earthquake measuring 8.3 on the Richter scale strikes San Francisco just after 5 a.m. The earthquake and the massive fire that followed kills an estimated 3,000.
' April 19, 1993: David Koresh and members of the Branch Davidian religious cult die after a 51-day standoff with the FBI outside Waco, Texas.
' April 20, 1999: Two students enter Columbine High School in Colorado and kill 13. Twenty more are wounded. Three of those events — the Titanic, the Bay of Pigs and Columbine — encapsulate the 150 years of newspaper history in Chattanooga of the Ochs family owned Times and the McDonald-owned News-Free Press. In 1912, there was the Daily Times; in 1961, there were the Times and the News-Free Press; and in 1999, there was only the Times Free Press — the combined paper that debuted Jan 5, 1999, after 65 years of competition. Here's a look at the journalism of the day in three different points in time. The Titanic was the largest ship in the world when it set sail from Southampton, England, headed for New York on April 10, 1912. The Titanic was nicknamed the "Millionaire's Special," according to Britannica.com. It was "fittingly captained by Edward J. Smith, who was known as the 'Millionaire's Captain' because of his popularity with wealthy passengers." The ship with 3,300 passengers and crew avoided icebergs six times before the seventh iceberg warning came shortly before midnight. According to National Geographic, Capt. Smith's last warning came at 2:17 a.m. on April 15. "Now it's every man for himself," he said. By 2:20, it says, the "Titanic's broken-off stern settles back into the water, becoming more level for a few minutes. Slowly fills with water and tilts its end high into the air before sinking into the sea. People in the water slowly freeze to death." The story read: "At 10:25 last night, the steamship Titanic called 'C.Q.D.' and reported having struck an iceberg. The steamer said that immediate assistance was required. "Half an hour afterwards, another message came reporting that they were sinking by the head and that women were being put off in the lifeboats." Two paragraphs later, the story continued, "The last signals from the Titanic were heard by the Virginian at 12:27. The wireless operator on the Virginian says these signals were blurred and ended abruptly." The Virginian was one of three ships reported to be "making haste toward" the Titanic. The lead story reported on that Friday was the "shocking" upset of former President Theodore Roosevelt's upstart Progressive Party winning the Pennsylvania primary. The front page contained more than 20 stories. The story of the Titanic never reappeared over the next week on the front page. On Page 10, the newspaper carried an ad from Davidson Clothing Co. promoting $18.50 men's suits. The ad also said, "We Will Close at 2 p.m. Going to the Ball Game." After Fidel Castro came to power in 1959, American President Dwight D. Eisenhower directed the Central Intelligence Agency in March 1960 to develop a plan to invade Cuba and overthrow of the Castro regime using Cuban exiles, known as Brigade 2506, backed by the U.S. military up to the point of putting troops on the ground. The plan was not activated, and John F. Kennedy won the White House in 1960. Kennedy, fearing the Soviet Union's backing of Castro, ordered the plan implemented in April 1961. Shortly after midnight, about 1,400 exiles went ashore near the Bay of Pigs. Nothing went right after that and the mission was declared a failure within days. It would lead the Cuban missile crisis in 1962 when Kennedy stared down Soviet leader Nikita Khrushchev after the Soviets placed ballistic missiles 90 miles from American soil. News, particularly U.S. military news, didn't surface to the public instantaneously with a tweet in 1961. The paper provided a two-column map showing the different landing sites of the exiles and two additional Cuba-related stories. Its lead story came from the New York Times News Service of Adolph Ochs. It was first-day reporting largely dependent on government information. A local issue, "slums and urban blight downtown," was important enough to the Times' editors to send a reporter to Norfolk, Virginia, to report on a delegation studying urban renewal there. The delegation included Mayor P.R. "Rudy" Olgiati, Chamber President E.Y. Chapin III and Realtor Pat St. Charles, who was heading an urban renewal at the Golden Gateway for the Chattanooga Housing Authority. The decision to put the local story on the front page on a day when America backed an invasion of another country may have had something to do with the fact that Ben Hale Golden, the publisher of the Times, was a member of the delegation. The afternoon, 22-page News-Free Press (7 cents) had 12 additional hours for content to surface from Associated Press and United Press International news wire services used by the News-Free Press. It moved the news forward for its readers to the heart of the matter, U.S.-Soviet relations. 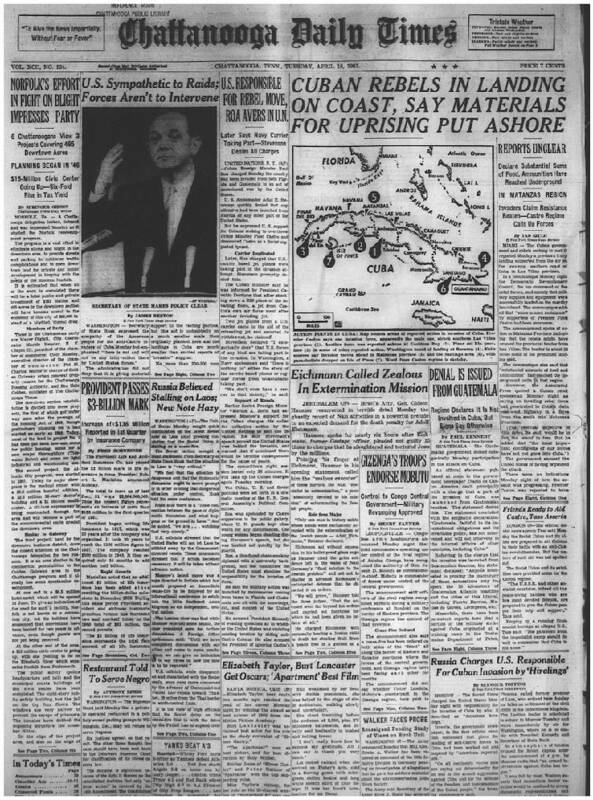 "'K' ASKS KENNEDY END CUBA WAR" covered the paper's eight columns at the top of the page. "K" was Nikita Khrushchev, leader of the Soviet Union. The paper reported on "20,000 to 25,000" demonstrators protesting at the U.S. Embassy in Havana and quoted the Soviet news agency Tass as saying the embassy was "besieged." The paper gave the first indications that the invasion was going poorly with a story headlined, "Castro Reported Using MIG Jets As Invading Forces Seize Airstrip." The report said, "The combined (Cuban) attacks by air and ground forces apparently constituted an all-out attempt to throw the invading troops back into the sea." The News-Free Press editorial talked of the "Red aggression" and U.S. assistance in Greece and Southeast Asia without committing troops. Southeast Asia would turn into the Vietnam War under Kennedy in a matter of years. The editorial said, "This situation brings into focus not only the American problem of Communist Cuba but the American problem of what direction our policy should take in relation to Communist regimes everywhere throughout the world." Using the advantage of an afternoon newspaper, the News-Free Press reported on its front page two local stories. One was the indictment of two car thieves, and the second carried a headline not likely to be seen in 2019, "TRAIN KILLS SWITCHMAN." The report said, "A railroad switching foreman who was to retire when he reached 65 in July was run over and killed by his train near the Siskin Steel and Supply Co. in South Chattanooga several minutes after noon today." Seventeen-year-old Dylan Klebold and 18-year-old Eric Harris walked into Columbine High School in Littleton, Colorado, at 11:19 a.m. PST on April 20, 1999, and started shooting. By the time they killed themselves at 12:08 p.m., 12 students and one teacher were dead. Twenty more were wounded. "Yesterday at school, nobody thought about being killed," said Dimitrice Hammond, the student body president at Red Bank High School, to the Times Free Press (50 cents) on the day after the shooting. "Now, half the people here are thinking and talking about what happened." "School Rampage Kills Up to 25" screamed the six-column banner headline on the front page of the 64-page, seven-section Times Free Press. It was late in the afternoon in Chattanooga when the scale of the shooting likely became clear to editors. Still, the paper was able to generate two local reaction stories for two pages inside the paper with content on the shooting. In an event on the same day of the shooting, the paper reported that four students at East Lake Middle School were suspended for bringing a handgun to school. The next day, the newspaper carried a story about the dangers of the internet and editorials from both sides of the editorial page. When the two newspapers merged in 1999, it kept both the conservative page of the News-Free Press and the liberal page of the Times. Today, the Times Free Press is unique in offering readers editorial pages from both sides of the ideological spectrum. The Times ended its editorial saying, "Increased funding for [school resource officers] would be a good investment in attention to troubled students." The same discussion took place at the Hamilton County school board in 2018 after the school shooting at Parkland High School in Florida. In 1999, four high schools and no middle schools have SROs; today, all high schools and middle schools have SROs. The Free Press ended its editorial by saying, "But it should be remembered that these are widely scattered horrors. They are in sharp contrast with the happy, peaceful, productive way that life usually goes on among fine young people at many thousand American schools that fortunately do not suffer great tragedies."